When the space key is pressed, the sprite will report the result of "1 + 2". When the space key is pressed, the sprite will report the result of "3 − 1". When the space key is pressed, the sprite will report the result of "2 × 3". When the space key is pressed, the sprite will report the result of "6 ÷ 2". When the space key is pressed, the sprite will say "Hello!" for a random number (2-5) of seconds. 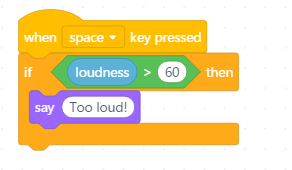 When the space key is pressed, if the loudness is greater than 50, the sprite will say "Too loud!". When the space key is pressed, if the distance the sprite to "Jellyfish1" is less than 10, the sprite will say "Too close!". When the space key is pressed, if current year is 2019, the sprite will say "Nice!". When the space key is pressed, the sprite will move forward for 10 steps. If touching "Jellyfish1" and "Jellyfish1" is pink, the sprite will go to (0,0). When the space key is pressed, the sprite will move forward for 10 steps. If touching "Jellyfish1" or the edge, the sprite will go to (0,0). When the space key is pressed, the sprite will move forward for 10 steps. 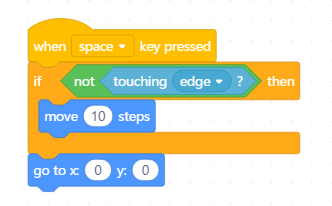 If touching the edge, the sprite will go to (0,0). When the space key is pressed, the sprite will report the first letter of "apple". When the space key is pressed, the sprite will report the length of "apple". When the space key is pressed, the sprite will ask what your favorite color is. 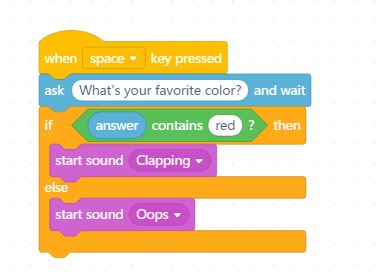 After you type in the answer, if your favorite color is red, the sound "Clapping" will be played; otherwise, the sound "Oops" will be played. When the space key is pressed, the sprite will report the remainder of "6 ÷ 4". Round the specified number to the nearest integer. When the space key is pressed, the sprite will report the rounded value of the timer. When the space key is pressed, the sprite will report the square root of 4.